Destin's sparkling white beaches, warm emerald water, and pleasant weather make it a popular beach vacation destination any time of year. Located in Northwest Florida's Panhandle along what is known as the Emerald Coast, its world-famous fishing defines it as the "world's luckiest fishing village." Considering its overall average high temperature of 75 degrees Fahrenheit (24 degrees Celsius) and an average low of just 61 F (16 C), it's no wonder it is a year-round golfing destination as well. If you're planning to travel to Destin, be sure to check out local weather forecasts so you can better pack for your trip. While you may need little more than a bathing suit, shorts, and sandals during the summer, fall and winter may require warmer attire like a light jacket for the cooler evenings. The highest recorded temperature in Destin was 107 degrees Fahrenheit (42 degrees Celsius) in 1980 and the lowest recorded temperature was a very cold 4 degrees Fahrenheit (-15.5 degrees Celsius) in 1985. On average, though, air and water temperatures and monthly rainfall totals don't vary much throughout the year, but the water's cooler at the end of the winter and warmer at the end of summer. Still, you'll need to check what the weather's going to be like during your stay if you hope to remain comfortable on your trip. The Atlantic hurricane season runs from June 1 through November 30, so if you're planning a vacation to Florida during those months it is important to follow these tips for traveling during hurricane season. However, no matter what time of year you plan to visit, you'll want to be sure to check local forecasts as Florida's weather is known to be drastically volatile, especially during hurricane season. The best and most reliable website to visit for current weather conditions, five and 10-day forecasts, and extreme weather updates is Weather.com, but if you're planning a Florida vacation or getaway, find out more about weather, events and crowd levels from our month-by-month guides. 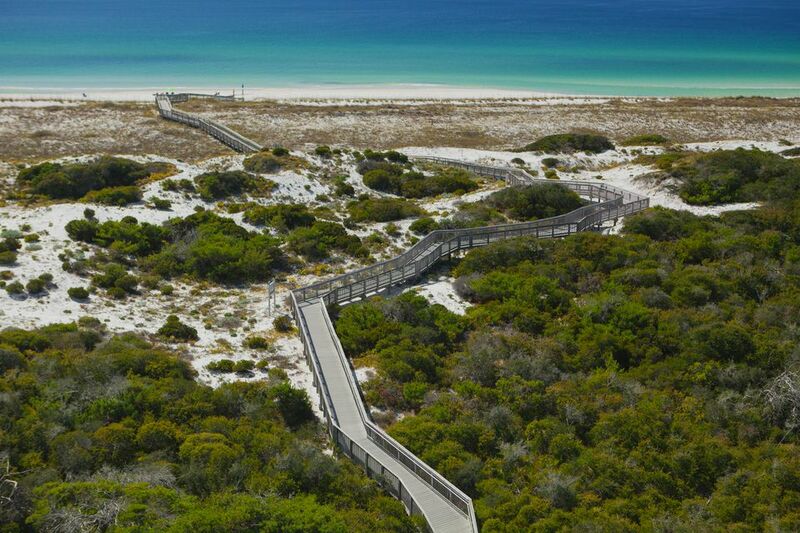 The most popular time to visit Destin, Florida is during the summer months of June, July, August, and September. Average highs for this time of year range between 87 in June to 89 degrees Fahrenheit (31 to 32 degrees Celsius) in August, with September cooling slightly to a high of 86 F (30 C). Lows—oftentimes only at night—average between 75 in June to 72 degrees Fahrenheit (24 to 22 degrees Celsius) in September. However, summer is also the rainy season in the Panhandle, bringing an average of 6 inches of rain in June, nearly 7 inches in both August and September, and almost 10 inches in July. Gulf water temperatures remain in the well above 80 degrees Fahrenheit (27 degrees Celsius) all summer long. What to pack: Since the weather conditions are likely to be mixed throughout the wet summer season, you'll need to pack a raincoat in addition to your beach-going gear to make sure you're prepared. Clothing made from light materials like linens and cotton that are breathable will be great for sunny days. When fall comes to northern Florida, it brings with it slightly cooler weather, while rain stops falling as constantly with only 4 to 5 inches each month. Also, Gulf temperatures range between 77 degrees Fahrenheit (25 degrees Celsius) in October to 62 degrees Fahrenheit (17 degrees Celsius) in December. What to pack: The later in the season you decide to visit northern Florida, the more warm the clothing you'll need. In September and October, be sure to bring a raincoat and umbrella, but switch those out for a light sweater or even a medium-weight winter coat in November and early December. Winter is even colder, with highs dropping to 61 and lows dropping to 45 degrees Fahrenheit (16 to 7 degrees Celsius) in January, but warm coastal weather comes up again in February and March. Rainfall remains between 5 and 7 inches for most of the season, and the gulf remains the coldest for this time of year, ranging from 61 in January to 68 degrees Fahrenheit (16 to 20 degrees Celsius) in March. What to pack: Although it never gets brutally cold in Florida's panhandle, you'll certainly want to pack clothing you can layer to accommodate for the varied weather. A raincoat won't be necessary for most of the month, but a light sweater or jacket may be necessary at night—especially if you're prone to getting cold. Spring warms up even more with April bringing highs of 74 and lows of 60 degrees Fahrenheit (23 and 16 degrees Celsius) while May takes the high to 82 and low to 68 (28 and 20 degrees Celsius). It doesn't rain much in spring, though, with less than 5 inches for each month of the season, but rainfall also picks up in early-to-mid June. What to pack: Spring may be the best time to visit as you won't need to bring much in terms of layers or extra gear. All you'll need is your beach gear—shorts, sandals, short-sleeved shirts, tank tops, plenty of sunscreen, and a beach blanket.